Dusty Walding, the “DW” in D.W. Pest Control Inc., has been a resident of Alachua County since 1976. He completed his high school education at Santa Fe High School, and went on to receive an Associates of Arts degree from Santa Fe Community College. 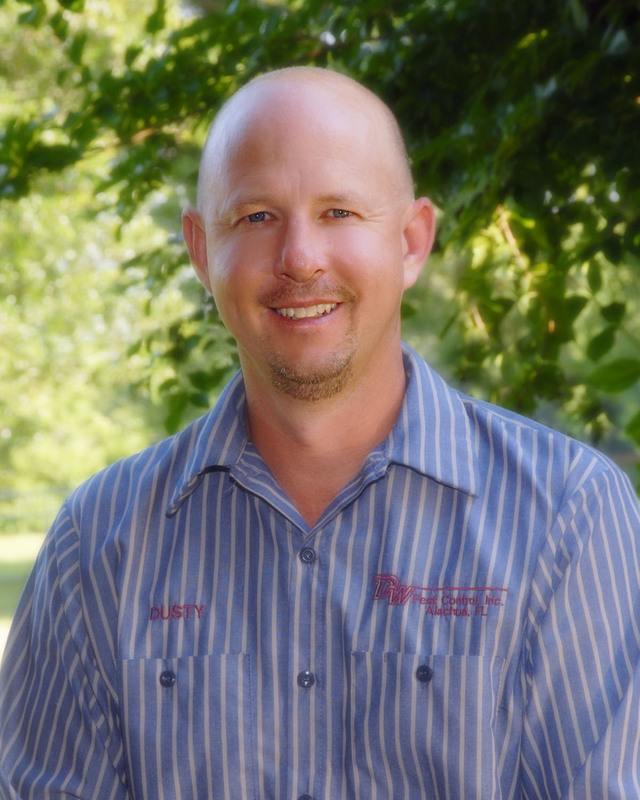 Dusty served as a State Officer for the Florida chapter of the Future Farmers of America, FFA, and has worked in all capacities of the pest control field since 1995. He is certified by the state of Florida for control of general household, lawn/ornamental pests, and termites. Amy Walding relocated from Southwest Florida to Alachua County in 1998 to attend the University of Florida where she received a Bachelor of Science degree in Exercise and Sports Sciences in 2001. She has been an active member of the D.W. Pest Control Inc. Team since 2006. Amy received her certification from the state of Florida for General Household Pest Control in 2011. In addition to managing the office, Amy assists with termite pre and post treatments as needed. Brooke and Chloe Walding are the youngest members of the D.W. Pest Control team. Both attend local Alachua County schools and enjoy reading and outdoor sports. They are involved with the business as their schedules allow, answering phones and notifying clients of scheduled service. Colton Tyner grew up in the High Springs/Newberry area. He began his pest control career with us in January 2016. He has completed courses through University of Florida as well as training with Dusty. He will be running a general household pest (GHP) route, and also assisting with Termite Inspections and Treatments. We are confident that you will be pleased with this young man and his ability to keep your home or business pest free.